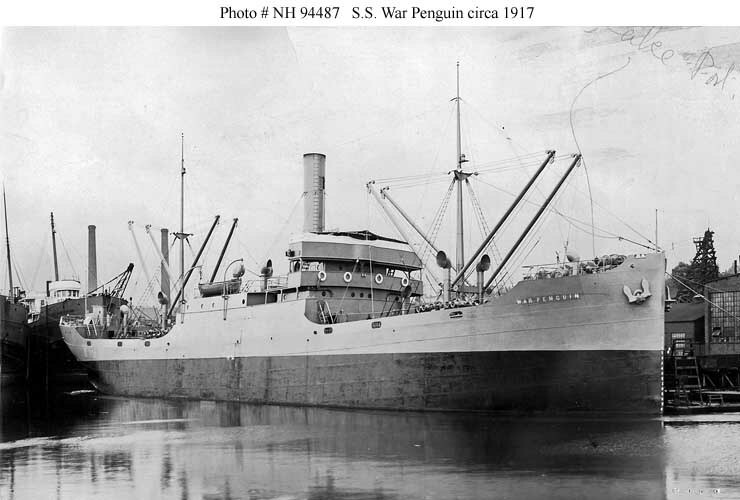 This list contains 354 cargo ships used by the Navy during World war I. 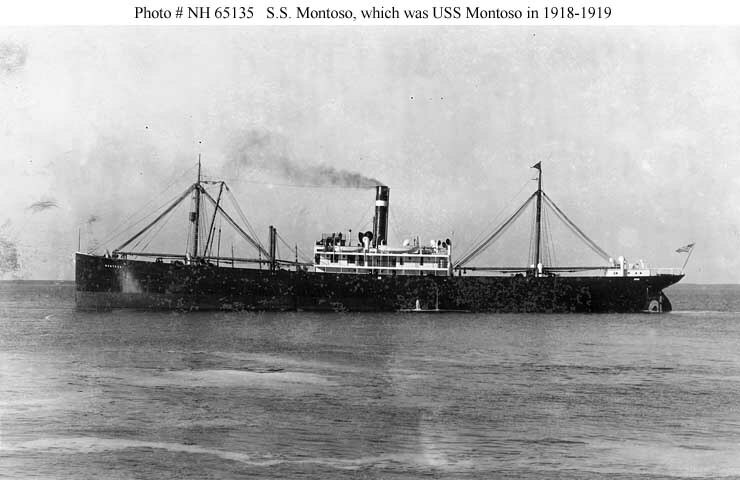 Between its establishment in January 1918 and late 1919 the U.S. Navy's Naval Overseas Transportation Service (NOTS) operated nearly all of these ships, primarily to carry supplies to American forces in the European combat zone and then help bring Army supplies and equipment back to the United States. 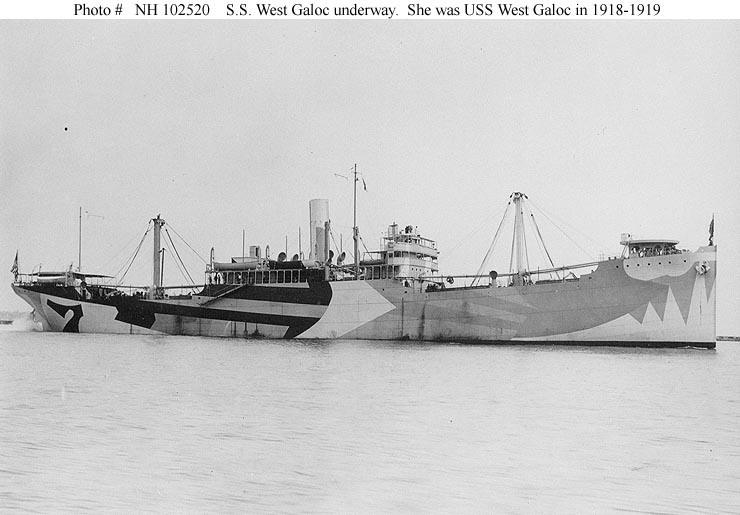 Thirteen of these cargo ships were lost during the war. 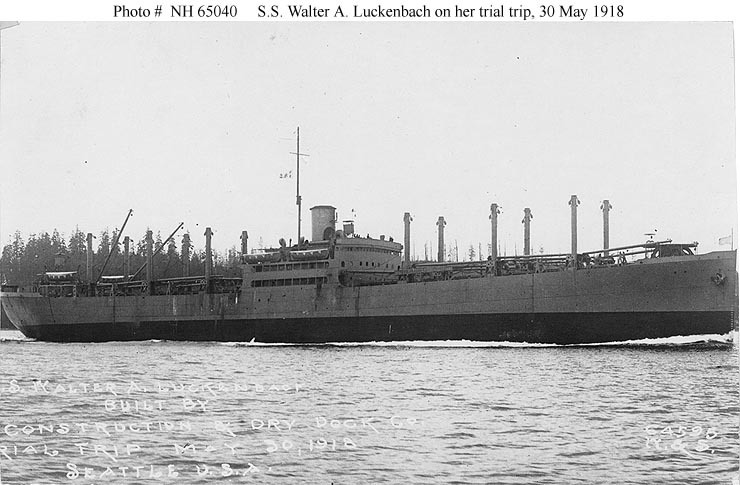 (The ships lost were Buenaventura, Californian, Herman Frasch, Lake Bloomington, Lake Borgne, Lake Damita, Lakemoor, Oosterdijk, Saetia, Ticonderoga, Westgate, Westover, and Zaanland.) 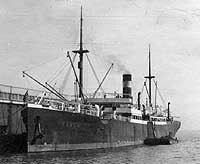 After the November 1918 armistice some of the larger NOTS cargo ships and some similar newly acquired vessels were hastily converted into troop transports and reassigned to the Cruiser and Transport force to help bring the soldiers home. 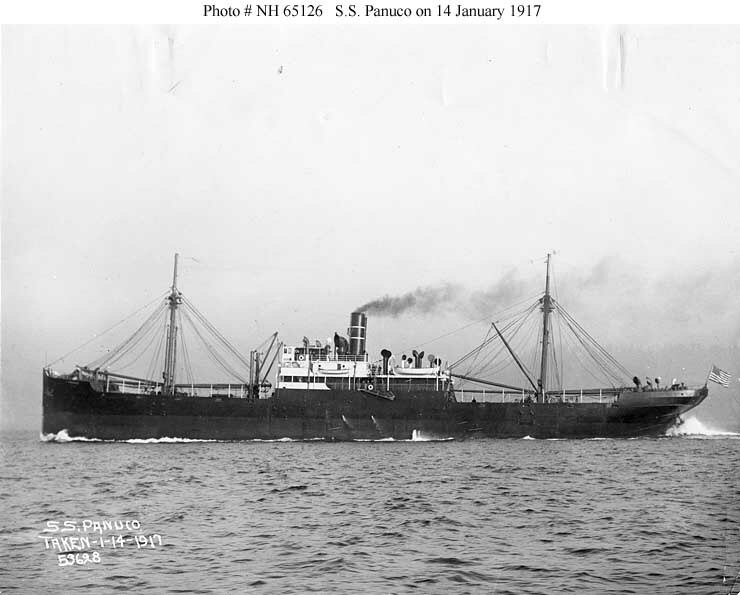 (These are listed both here and on the page for "World War I Era Transports" in a section entitled "freighters converted to transports.") 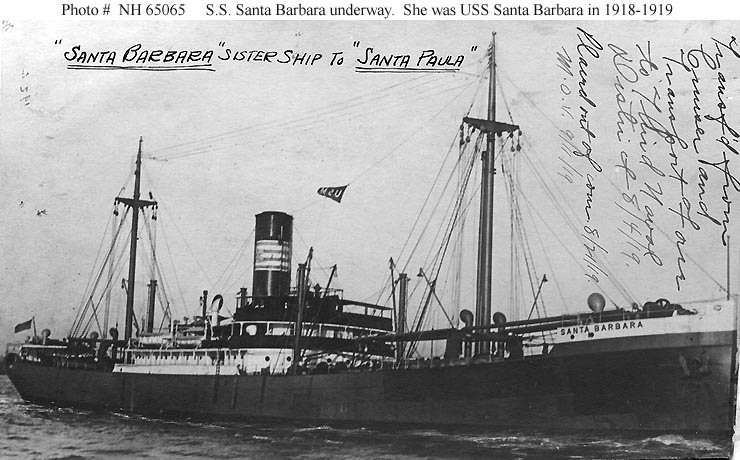 For some special-purpose cargo ships see the pages on "World War I Era Supply Ships and Refrigerated Cargo Ships" and "World War I Era Colliers." This large number of U.S. Navy cargo ships is divided here into eighteen groups, containing between 1 and 57 vessels. 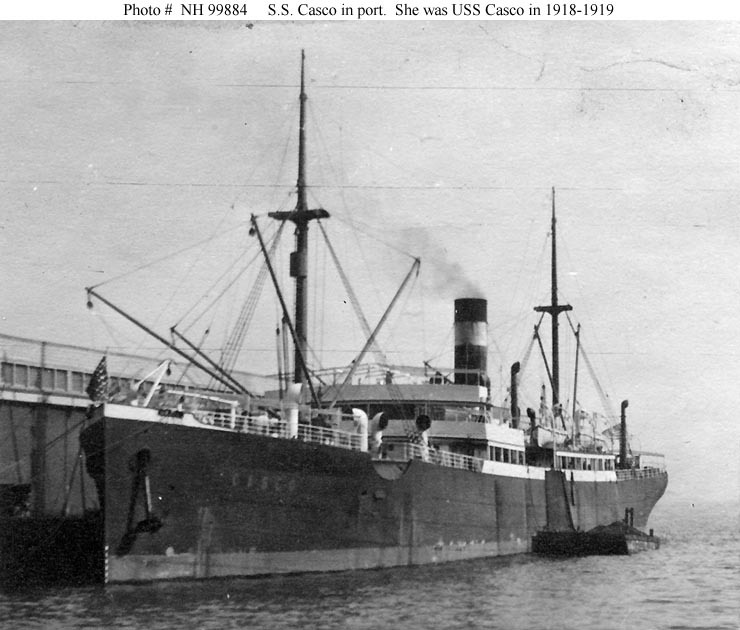 The cargo ships differ from World War I era transports, which are easily categorized by number of smokestacks and number of masts, because all but a few of the cargo ships had two single masts, one fore and one aft, and one smokestack. (In addition, nearly all had plumb bows and counter sterns.) Instead the groups of cargo ships are defined by basic characteristics of their entire rig (the number of single and paired uprights--masts and kingposts respectively) and the basic features of their deck lines (the number and location of hull islands). In some cases the ships are further subdivided by the location of the uprights. Nearly all kingposts did double duty as ventilators--many had fancy tops and some looked like cowl ventilators with booms. Although mainly intended as a tool for ship picture identification, these groups and the similar groups on the "World War I Era Transports" page are also useful for analysis and understanding of the Navy's huge but temporary World War I inventory of large non-combatant vessels. Some of these cargo ships are listed as having been built to Emergency Fleet Corporation Designs or as being precursors to those designs. 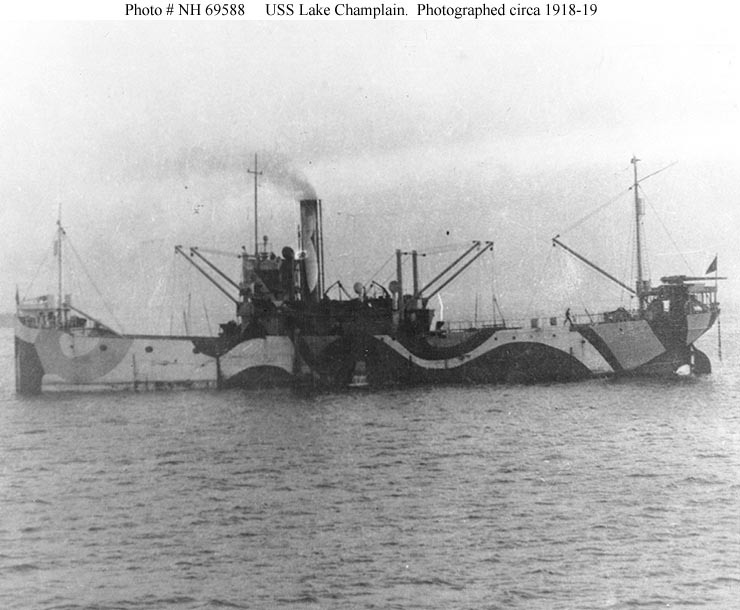 Beginning in 1916 U.S. shipyards received a surge of orders for new ships, mostly from Great Britain, as the Allies strove to offset heavy losses to the German U-Boat campaign. The designs for these ships were mostly developed by the individual shipyards according to their individual practices with inputs from the foreign buyers. 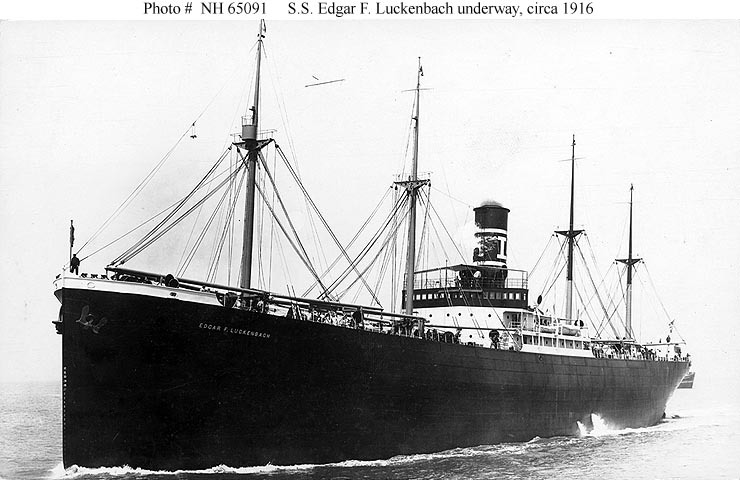 In April 1917, following U.S. entry into World War I, the U. S. Shipping Board established a commercial enterprise, the Emergency Fleet Corporation (EFC), to build the huge number of merchant ships that the U.S. would need to prosecute the war. As it placed its contracts, the EFC generally adopted and assigned numbers to the designs already being used by the shipbuilders. 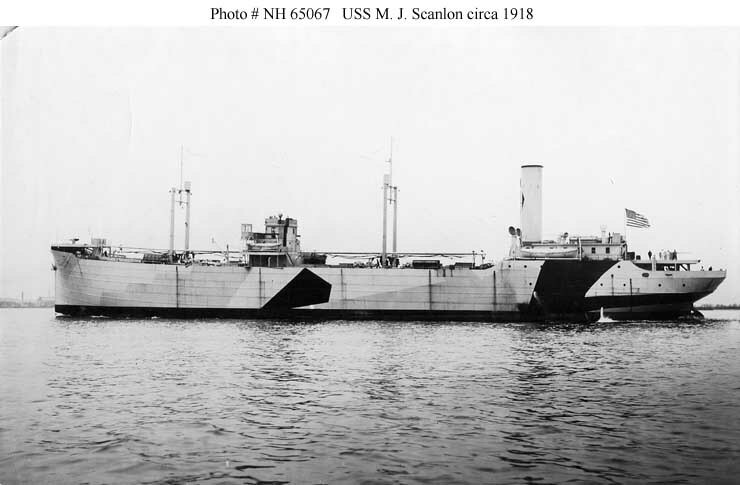 In August 1917 the EFC requisitioned all ships in U.S. shipyards that had not already been completed and delivered to their owners--this order affected around 434 ships including most of the ones ordered by the British and their allies. Technically, only the ships ordered under EFC contracts were built to the EFC designs, but many of the ships built under the earlier foreign orders were constructed to essentially identical designs and are listed here as precursors to the EFC designs. The design with the greatest number of representatives in this list is Emergency Fleet Corporation Design 1013, with 58 ships (including precursors) in two groups that differ only in their rigs. During the war some U.S.-built ships were given modified rigs, probably intended to reduce vulnerability to submarine attack. In these ships, the topmasts on the single masts fore and aft were removed and a single topmast was fitted on a kingpost near the smokestack. (If there were no kingposts near the stack, a light pole was added to support the topmast. At this time the main purpose of this topmast--or of the two regular topmasts in the ships that retained them--was to support radio antennas.) In order not to separate these ships from their normally-rigged sisters, the topmasts and light poles amidships are excluded from the definitions of the ship groups presented here. A more extreme variation, seen primarily in the earliest war-built ships, also included the replacement of the single masts fore and aft with short paired uprights (kingposts). These ships, which thus lacked any single masts besides the single topmast amidships, are covered separately in their own group at the top of this list. 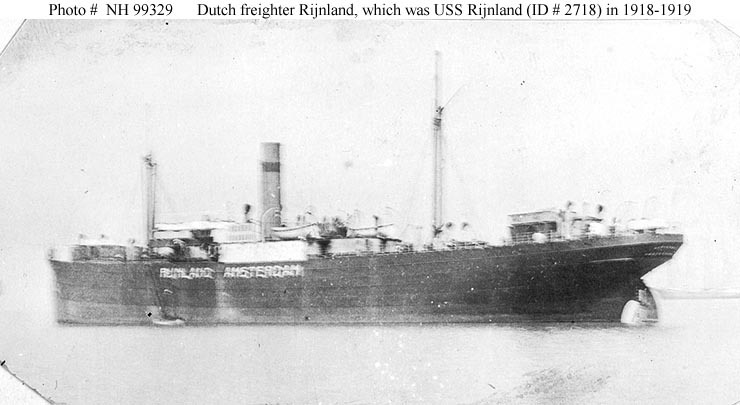 Some Dutch-origin ships had an unusual type of very tall paired mast instead of the standard type of single mast. To avoid arbitrarily separating these ships from their normally-rigged Dutch counterparts, these special Dutch uprights are treated here as single masts even though they are paired. 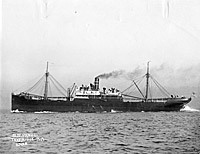 A few ships, mostly ex-German, had a single short upright in the extreme stern, usually rigged with a boom. Because of its height, location, and use, this is counted as a kingpost (if it is counted at all) even though it is not paired. 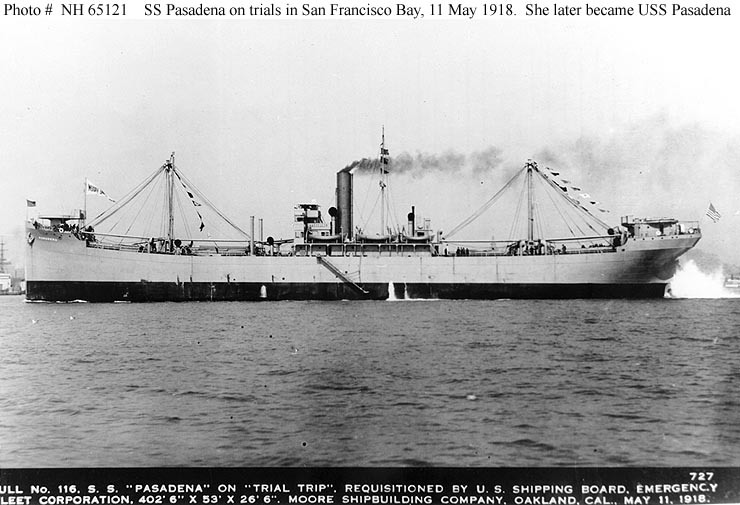 USS Pensacola (ex German Nicaria) also had an upright in this position but it was a full-height mast. The few cargo ships that had their engines (and their smokestacks) aft are covered in a separate category near the end of the list, as are a few passenger-type ships used as cargo ships and the 23 ships for which configuration information was unavailable. 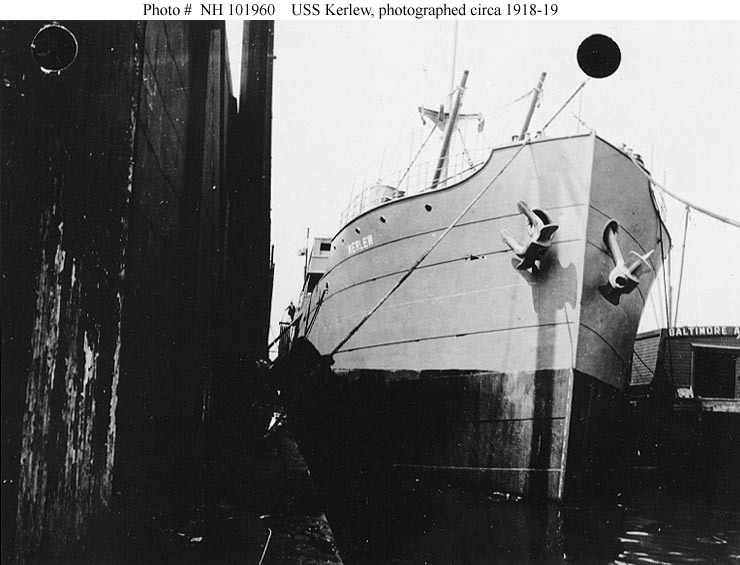 A Note on Sources: The basic source for the cargo ships serving in NOTS is the book by Lewis P. Clephane, History of the Naval Overseas Transportation Service in World War I,, published by the Naval History Division, Washington, D.C., in 1969. Tonnage (in gross tons except for ships built by the Navy) and dimensions were taken from a file of World War I-era ship data cards now in the custody of the Naval Historical Center and from the 1918 and 1919 editions of the Ships Data Book (whose data usually matches that on the cards). 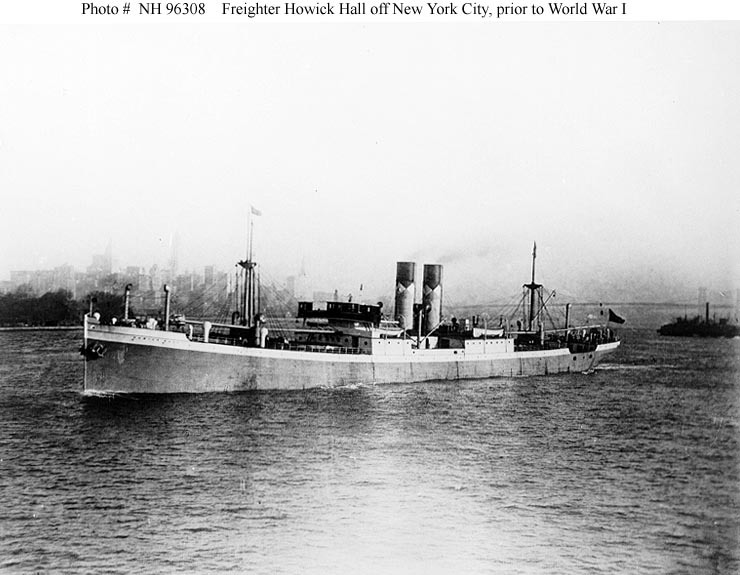 Additional information came from the 1918-1919 and 1919-1920 editions of Lloyds Register of Shipping and from the Dictionary of American Naval Fighting Ships. 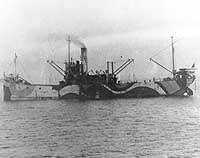 This page features a list of World War I era U.S. Navy cargo ship groups, defined by ships' physical characteristics, with links to pages dedicated to each group of ships. Those pages provide further links to the individual ships in each group. Representative photographs are also presented for ship groups and for individual vessels.